Home » Page Type » Articles » What were Network Members reading in 1975? Back in 1975 I ran a bookshop called “The Gateway” in Ojai, California: Books for Mind Body and Spirit. Meanwhile on this side of the Atlantic the Scientific and Medical Network was taking shape. In those days, the Network was a group of scientists and doctors brought together by George Blaker, Peter Leggett, Patrick Shakleton and others, all linked by a conviction that the human being was much more than a physical organism. We are also endowed with spiritual abilities that are demonstrable. The SMN was then (as it is today) a forum for sharing new and provocative ideas. In the first newsletter, dated 18th January 1974, a list of books was suggested so that new members could better understand what the group was all about. Recently, David Lorimer discovered that list. I was amazed to find that most of the titles were on the shelves of my California bookshop — and we did not stock that many books. I remember selling copies of Roberto Assagioli’s, The Act of Will, books by Lawrence and Phoebe Bendit, Shafica Karagulla, E Lester Smith, Krishnamurti, Teilhard de Chardin, John Michell and Evelyn Underhill. Whatever new creative impulse was awakening in Britain was also awakening in California. 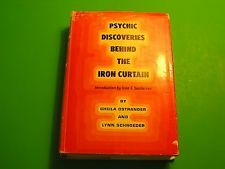 On campus, the book that everyone was talking about was Oestrander and Schroeder’s, Psychic Discoveries behind the Iron Curtain. The book alleged that research into the paranormal was being taken seriously in the Soviet Union. Something to worry about. Not only were there details of experiments into psychokinesis and telepathy, and hypnosis at a distance, but also of devices to store and enhance psychic energy were being built. New military applications? The book made pyramids fashionable. We tried out home models to see if they would sharpen razor blades we placed inside them. Forty years later, the number of mind-body-spirit books published annually has more than quadrupled. Yet many books on the original list are definitive texts that have not been superseded: books by C.G. Jung, William James, Koestler, H.S. Burr, Henri Bergson, Teilhard de Chardin and Roberto Assagioli, to name a few are still widely read. Today one would no doubt build a different book list. Please send your suggestions for a list of top twenty books that you think everyone who has an interest in this field ought to have at least perused, if not read.